Pittsburgh, PA (September 28, 2017) – With over 60 years of experience and an impressive market share, it’s easy to understand why Howard Hanna is the luxury home leader. Our Homes of Distinction program was created out of the need to serve this special buyer and seller demographic. Each year, Howard Hanna gathers the most beautiful high-end homes to create a stunning Homes of Distinction magazine. This sophisticated magazine is a vital part of the luxury Homes of Distinction program that has been providing specialty services to upscale buyers and sellers for decades. 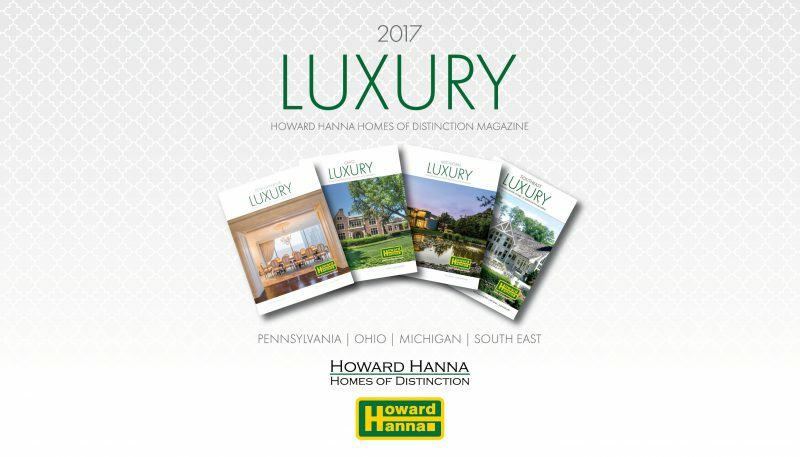 As a market leader, Howard Hanna recognizes the importance of a complementary Homes of Distinction Magazine with curated content from the company’s eight states. The annual magazine offers a collection of homes priced at $750,000 or above and delivers a sneak peek into the world of upscale real estate. Discerning buyers and sellers choose Howard Hanna and the Homes of Distinction program for its many proven benefits including a customized marketing plan, tailored property URL, elegant direct mail pieces, email outreach and more. It also includes six decades of Howard Hanna experience, unmatched market share, and an international affiliation with Luxury Portfolio International. Howard Hanna Real Estate Services is the 3rd largest real estate company in America, the #1 privately owned broker in the nation, and the largest home seller in Pennsylvania, Ohio, and New York. The family-owned and operated real estate company specializes in residential and commercial brokerage service, mortgages, closing and title insurance, land development, appraisal services, insurance services, corporate relocation and property management. With 259 offices across PA, OH, NY, VA, MI, WV, NC and MD, our more than 9,000 sales associates and staff are guided by a spirit of integrity in all aspects of the real estate process.